Sherman Oaks (Spiritsman) 5/6/18/–Frida Mexican Cuisine the popular authentic traditional Mexican restaurant has recently opened a new location in the Sherman Oaks Galleria . 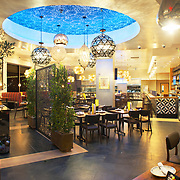 Frida Mexican Cuisine restaurant has 5 other full service locations Beverly Hills, Westwood, Torrance, Cerritos and a casual dining in Brentwood Frida Tacos . 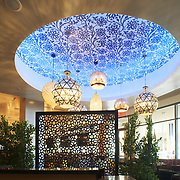 Media were invited to view the newly renovated restaurant and taste the new menu by Owner and Chef Vincent Del Rio. The 5 course diner included over 20 of the top media food journalists and social media gurus. The evening began in a private party room at the back of the restaurant for larger group luncheons and dinners. 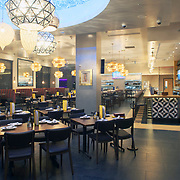 The recent renovations have charmed the restaurant with sparkling appointed lighting and banquets in a chic popular color theme of blues and greens. Cocktails started the evening with a choice of Skinny Margarita or the popular Paloma (margarita) served in a mason jar and packed with a fruity punch. Appetizers were served family style and began with the popular Frida Guacamole which was hand made to order on the table with the fresh avocados tossed and served with spices right before our very own eyes. The guacamole dip is delicious and obviously very fresh. All the food is prepared daily at Frida and has that vibrant fresh taste and its own personal twist on traditional Mexican fare. Mini Sopes of Chorizo and Mini Sopes with Queso & Creama were served , the lovely little waffle like appetizers topped with cheese and cream and dash of seasoning, second round was even tastier. A sope also referred to as a picadita it is a traditional Mexican dish originating in the central and southern parts of Mexico. Sopes looks like an unusually thick tortilla with vegetables and meat toppings. Authentic Mexican Sopes are a thick corn cake top with many ingredients they are gluten free, vegetarian, vegan and dairy free. Ceviche was served in clear glasses with lots of cilantro seasoning in liquid tossed with Shrimp, Fish and Camaron (Shrimp Rasurado, Aguachile de Camaron, Frida Fish) Camarón Rasurado Ceviche. Fresh shrimp with avocado, jalapeño chile, red onions, and cilantro; prepared with olive oil and lime juice. The next course was my favorite Camarones al Ajillo also known as Gambas al Ajillo in Spain. This shrimp dish has a wonderful garlic flavor served over rice . Large shrimp are cooked with cloves of garlic that made this a popular and fragrant dish. My colleague the meat eater tried the “Arrachera Nortena” and remarked it was very tasty skirt steak and enchilada in ancho sauce that nicely balanced each other. The traditional Mexican classics Molcajete Frida was also served family style for media to share and taste this giant boiling bowl of slightly spicy salsa verde sauce, made with tomatillos onions and cilantro, served with nopales (grilled cactus), chicken, juicy carne asada,(steak) and a creamy queso panela this is a Mexican cottage cheese made from pasteurized cow’s milk. Tacos were served in every flavor chicken mole, grill chicken, grill beef, carnitas, and fresh white fish grilled fish tacos were superb. Dessert table was filled with Churros con cajeta the Mexican version of a donut fried dough with brown sugar and cinnamon spices very nice not too sweet or greasy and flan Neapolitan tasty not my thing but the Pastel Tres Leches this sponge cake butter cake soaked in three kinds of milk: evaporated milk, condensed milk, and heavy cream. this dessert the real winner of the night . The bar was flowing with cocktails the whole night, most popular choices were the Skinny Margarita in the large blue rimmed glass and half the calories with all flavor a bit tarte yet tangy and then the Paloma Margarita served in a large mason jar and flavored with grenadine grapefruit juice and lime juice superfine sugar and a pinch of a salt tangy and so delicious, also a favorite and very tangy tasting the pasion de tamarindo. The tamarindo is an agua fresca drink typically served throughout Latin America. It is made from tamarind (a legume) after it has been boiled in water and seeds removed, they liquefy and combine with sugar. This drink is quite popular and worth the visit for something new yet traditional. 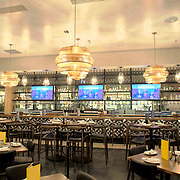 Frida Sherman Oaks is a fun authentic Mexican family style restaurant with full bar . 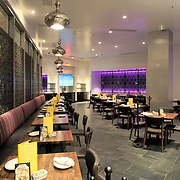 at the Sherman Oaks Galleria 15301 Ventura Blvd. 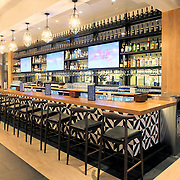 Frida the popular Mexican Restaurant has recently opened a 6th location in the Sherman Oaks Galleria, Paloma Margarita, Skinny Margarita or the popular Paloma (margarita) served in a mason jar and packed with a fruity punch., The tamarindo is an agua fresca drink permalink.